Dawn French stars alongside returning London Palladium pantomime royalty Julian Clary, Paul Zerdin, Nigel Havers and Gary Wilmot as well as Strictly Come Dancing’s Vincent & Flavia in Snow White, London’s must-see panto. 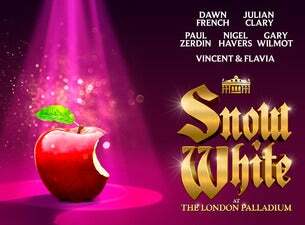 From the same team behind last year’s Olivier Award-winning pantomime, Snow White will feature all the sparkle, scale and spectacle London has come to expect from the West End’s most lavish festive production in a show packed full of laughter, music, special effects and theatrical magic. With further casting to be announced and a strictly limited five week run, secure your seats now for Snow White at the London Palladium, the fairest pantomime of them all.